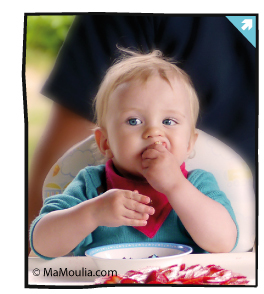 The adjustable Bandana Scarf/Bib comes in double layers of 100% natural merino wool. The wonderful qualities of wool ensure that your little one stays warm and happy even when wet from drool and dribble. The bandana scarfs can be worn either on top of clothing as a stylish accessory or underneath as protective layers. Supersoft and stretchy, fitting and comfortable. Perfect for everyday wear during the whole first year and later as a safe and easy scarf. Saves on laundry too and those "hated" bodysuit changes! The ManyMonths Bandana Scarfs keep babies' clothing dry, their chest warm and protects them against dribble rash: all of this fully breathable without any waterproof layer or man-made fibres. A must-have for the teething months and during the cold season to keep every child comfortable in all kinds of weather. Also stays in place much better than an ordinary scarf. Adjustable with sewn-on snap tape, better durability, superior comfort and no metal parts. Comes in one size that fits baby to adult! When designer Bettina Lindblom's 3rd baby was born in the fall of 2011, she couldn't find any woollen bandana bibs on the market. After hand-knitting several different ones she found the garment so useful, keeping her baby's chest warm and comfortable, that she wanted to include wool bandanas in the ManyMonths assortment as well. In the design/sample testing process the "big boys" (6 and 10 y. at the time) loved the product as well, both for play and for warmth. Even grandmother wanted one sample for herself! It is so comfortable. Very easy to use, looks really trendy and cool, also for bigger kids as you can see in the pictures.